Brown adipokines are regulatory factors secreted by brown and beige adipocytes that exhibit endocrine, paracrine, and autocrine actions. Peptidic and non-peptidic molecules, including miRNAs and lipids, are constituents of brown adipokines. Brown adipose tissue remodeling to meet thermogenic needs is dependent on the secretory properties of brown/beige adipocytes. The association between brown fat activity and a healthy metabolic profile, in relation to energy balance and glucose and lipid homeostasis, is influenced by the endocrine actions of brown adipokines. A comprehensive knowledge of the brown adipocyte secretome is still lacking. Advancements in the identification and characterization of brown adipokines will facilitate therapeutic interventions for metabolic diseases, as these molecules are obvious candidates to therapeutic agents. 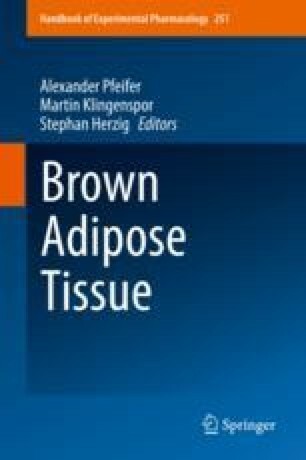 Moreover, identification of brown adipokines as circulating biomarkers of brown adipose tissue activity may be particularly useful for noninvasive assessment of brown adipose tissue alterations in human pathologies. This work has been supported by Grants SAF2017-85722-R from the Ministerio de Ciencia e Innovación (MINECO) and PI17/00420 from the Instituto de Salud Carlos III, Spain, cofinanced by the European Regional Development Fund (ERDF), and Fundació Marató de TV3 (grant 201612-30). M.P. and J.V. are “Juan de la Cierva” researchers (MINECO, Spain).